You Won’t Believe How Delicious These Tacos Are! Last month we showed how easy it is to create a tasty and healthy roast in the slow cooker using The Bos Creek chuck roast. 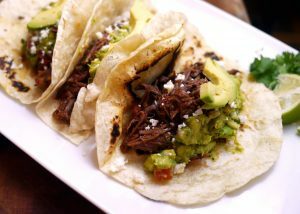 This time we’re going to show how easy it is to make delicious Braised Grass-fed Beef Tacos using the same chuck roast from The Bos Creek. Add the vegetable oil to a cast iron skillet and heat on medium high heat until the oil ripples but doesn’t smoke. Brown the chuck roast on all sides, approximately 2-3 minutes, remove from skillet and put in a dutch oven. Add the onion and beef stock to the dutch oven. Cover and simmer for two hours on low heat. Add the San Marzano tomatoes and simmer for another two hours until the roast shreds easily with a fork and the liquid has reduced down to a sauce. Shred the meat and serve on grilled taco shells. Garnish with cotija cheese, limes, cilantro, hot sauce and guacamole. These tacos are hit at the table any time of the year, and they’re easy on the waistline! Visit The Bos Creek for more information on how to get clean, healthy, and delicious grass-fed beef, including the chuck roast used in this recipe, delivered straight to your door. Vegetable Oil? I haven’t used it in years…only coconut oil, olive oil or butter. Much more healthy. Maybe that was a typo. 🙂 I’m anxious to try the zucchini taco shells, so this sounds good! What are the nutrition facts on this recipe?